You may or may not remember that Facebook took the opportunity last month to introduce its new chat bot experience that has been integrated into the evolving Messenger platform. The chat bot integration is essentially Facebook’s way of allowing developers and businesses to build automated bots into Messenger that will allow users to benefit from services without any kind of human interaction on the opposite side. As that platform develops, Facebook will allow more bots to come along for the ride, with one of the newest early entrants being the “Jarvis” experience. It’s undoubtedly going to take a little bit of time for users to get used to being able to interact and talk with these bots like they are a human being on the other end of the conversation. While we are aware that these are essentially automated software solutions, it’s difficult to not think of them as actually having a personality, no matter how rudimentary or simplified the experience is built to be. Jarvis bot is currently in its early form, but will assist with productivity by reminding you to do things directly from within the Messenger platform. On first contact with Jarvis, “he” will ask you to state which city you actually live in. This is all part of the linear conversation flow, and allows Jarvis to get an instant idea of location and timezone to be able to set reminders that actually matter and that are worthwhile to the user. After the city is provided in the chat, Jarvis will confirm the timezone by messaging you the current time in your location. The service is then primed to start taking orders and to start setting up those reminders on your behalf. Users interacting with Jarvis can say simple things like “remind me to pick up my son tomorrow at 20:00”, or “remind me to go shopping first thing in the morning”. Jarvis will then reply with confirmation that the command has been understood, along with a recap of what he will actually be doing and the time that the reminder will come. All of this happens pretty much instantly and inline in a standard Messenger conversation. Want to delete a reminder? Well you’re kind of in a pickle with that one there. I was only able to “delete all reminders” at best, so if you wish to delete one specific reminder, there doesn’t appear to be an option or command for that, in my experience at least. 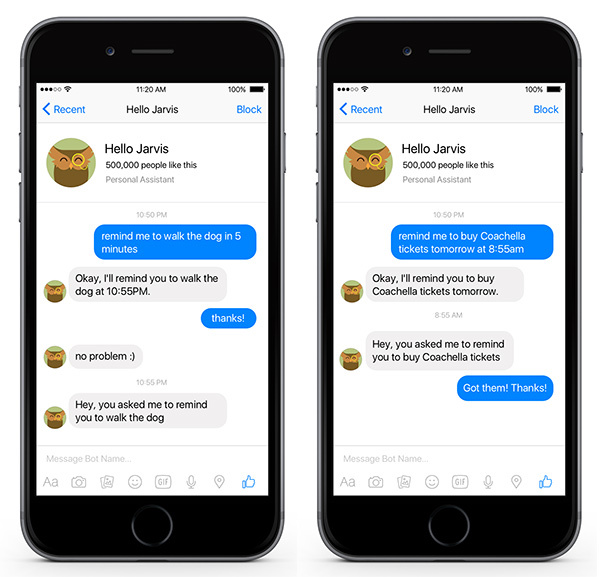 To get started with Jarvis on Facebook Messenger, simply head over to hellojarvis.io and you can proceed from there. 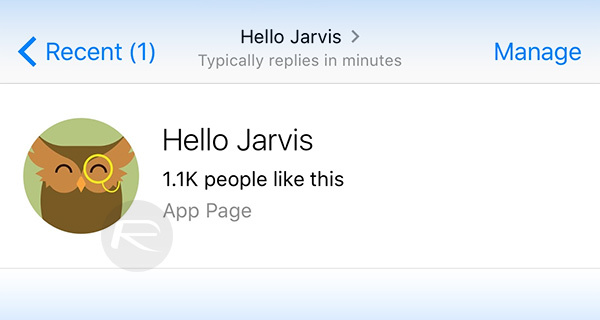 Alternatively you can simply search for “Hello Jarvis” in the web-based Messenger or the Messenger app on iOS or Android. In case you aren’t aware of Facebook’s chat bot phenomenon, you can check out our initial coverage of the reveal during Facebook’s F8 conference. Is this Jarvis bot the same bot that’s already on the Google play store and has been for years or have they stolen a copyrighted and trademarked name to create there fb bot.